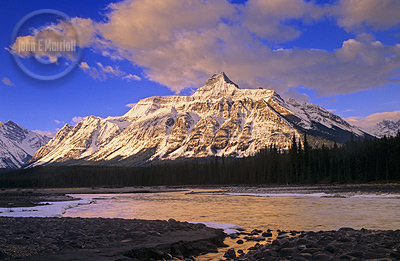 A Jasper National Park vacation offers endless opportunities for enjoying the Canadian Rockies‘ largest national park. Hiking in one of the most popular ways of experiencing the natural wonders Jasper has to offer. There are an enormous number of well-serviced trails here, taking you to many part of the park. Jasper National Park offers some of the best hikes of the Canadian Rockies. Below, we complied a few of the hikes just south of Jasper townsite. To reach these trails, take Highway 93 (the Icefields Parkway) south toward Lake Louise. For this hike, you’ll take Trails 9a and 9b for 4.2 km. It’s about a 2-3 hour hike. To get to the trailhead from Jasper, drive 9 km south on Highway 93. The five small lakes are the highlights of this popular hike for vacationing families in Jasper. Trail 9a starts with an easy hike through a forest of lodgepole pine, reaching a boardwalk across the Wabasso Creek wetlands in the first kilometre. Soon the trail crosses a flower meadow to a junction. Keep hiking Trail 9a to reach Fifth Lake, with its small island and nesting loons. Look for 9a markers leading left toward Fourth Lake, Third and Second, each a different depth and thus a different hue of bluegreen. Between Second and First lakes turn left onto Trail 9b and follow it to close the loop. Or keep going north to Old Fort Point, 10 km farther via trails 9a, 9 and 1, mostly in the woods. For this hike, you’ll be on Trail 9. You’ll have the option to do a 6.2 km, half-day hike, or a 11 km full-day hike. You’ll find the trailhead 14.6 km south on Highway 93. The hike takes you across several low ridges, with a terrific views across the Athabasca Valley to Mt. Edith Cavell when you get to the end of the ridges. Interestingly, Wabasso Lake was created by beavers. You’ll see their long, high dam at the northeast corner of the lake. If you’re interested in a longer hike, follow Trail 9 around the lakeshore and 6 km north along grassy Wabasso Creek to the junction with Trail 9a (Five Lakes). It’s less than a kilometre back to the highway from here.